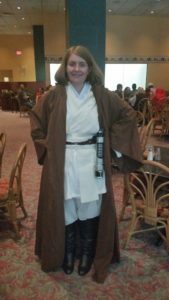 I set my alarm for 7:10 AM on Saturday morning, giving myself just enough time to shower, get dressed in my Jedi outfit, walk over to the Marriott while eating a banana, and get on the shuttle to the parade staging area by 9:00. I got to the shuttle pick-up point just before 9. There was a long, but very fast-moving line for the shuttles, and everyone in it was wearing a really cool costume, so it was a lot of fun to people-watch while waiting in line. Rey and a very nicely-done Jyn Erso. 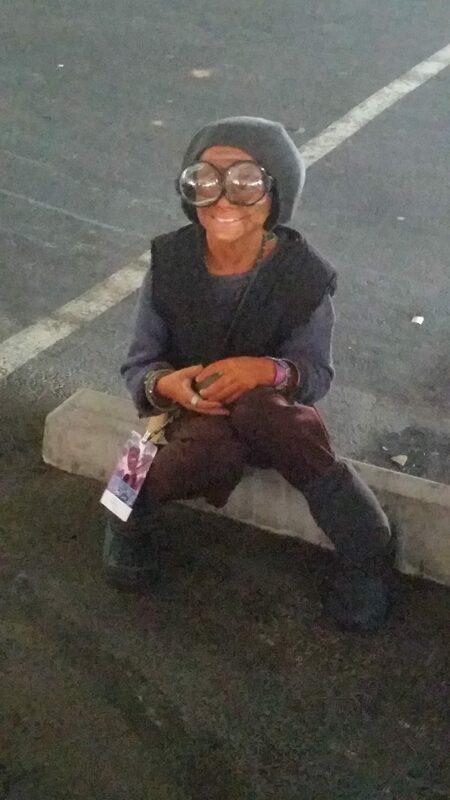 Adorable little kid as Maz Kanata. 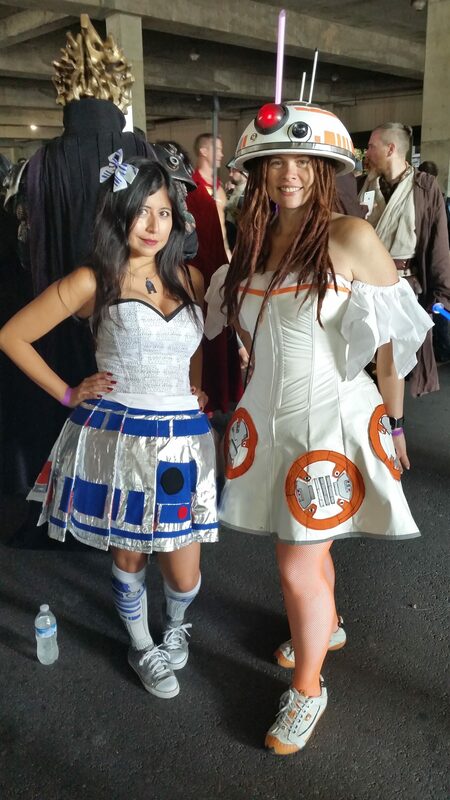 The lady on the left created the most amazing costume design. The pleats on her skirt are all double-sided, with an R2-D2 pattern on one side and a BB-8 pattern on the other, and she can flip them over by twirling around. 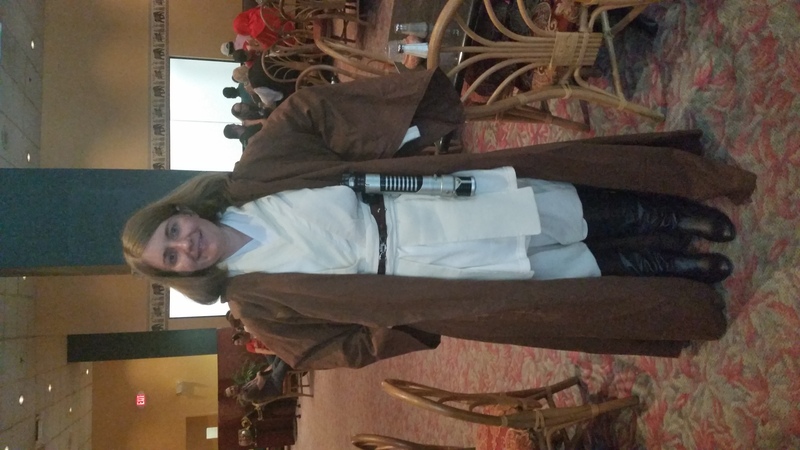 She was by far the hit of our subgroup of Star Wars costumers. 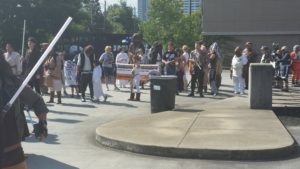 Those of us who didn’t belong to any of the organized costuming clubs all ended up gathering together at the very front of the Star Wars unit as we moved closer to the entrance to the parade route. 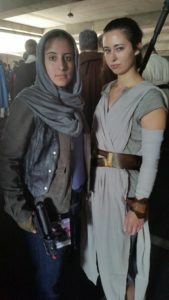 In my head, I dubbed us the “Rebels Without a Club” (even though a lot of us were dressed as villains). On the ramp leading to the entrance to the parade route. The view from the beginning of the parade route. 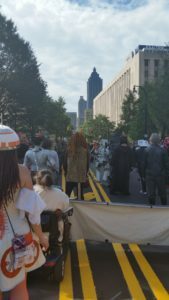 The parade itself was a blast. Just like in my local Fourth of July parade, I couldn’t stop smiling the entire time. 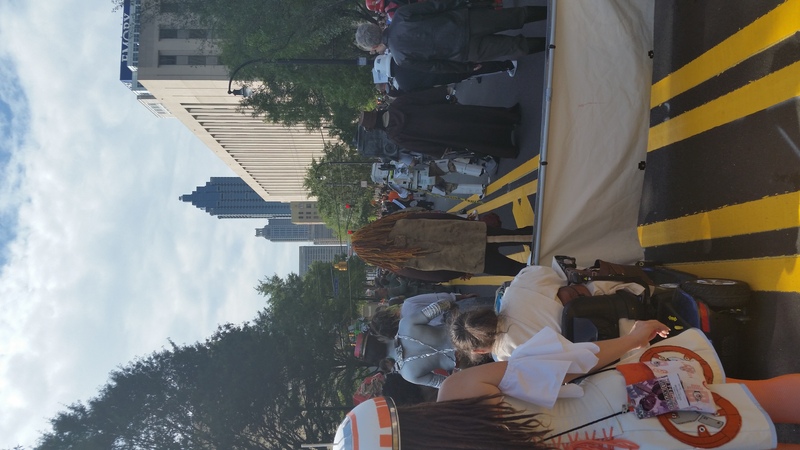 There were lots of cheers, applause, and high-fives, and tons and tons of people crowding the parade route, many of them in costume themselves. I think I had almost as much fun watching them as they had watching me. The dispersal point at the end of the parade was the main entrance to the Marriott. I wandered around in there for a bit, taking in the con atmosphere and cooling off, and then made plans to go and have lunch with Dave Slusher, one of my fellow podcasters. We went to an Indian buffet, where we had a really good lunch and talked about podcasting and other creative endeavors. I recorded a show ID clip for one of his shows, the Mad at Dad Podcast, and he took a picture of me in the outfit I’d been wearing during the parade.